This is a book for those who are trying to cope with an illness and those who have survived. It is a book for any person who loves the beauty that Mother Nature has given this world. In addition to Ms. Brackett's written responses to the different photos, there are spaces for the reader to share his/her musings. 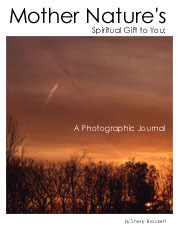 Thus, it is more than a book of breathtaking photos; it is a journal. It allows readers an opportunity to write their own personal responses to the work and life as a whole. I would like to finish by saying thank you for sharing a moment of your time with me...Go, and let life embrace you to the max and remember "one good thing each day." Ms. Sherry Brackett is a retiree from a major automotive company, a wife, mother, and grandmother, and a cancer survivor. As a cancer survivor, perhaps, this experience has sharpened her sense of what is important and given her the ability to capture it on film. Every photograph clearly illustrates the title. Ms. Brackett's keen eye at seeing Nature at her best is incomparable. There are many talented photographers. However, there are those who demonstrate more than talent; they demonstrate a gift. Ms. Brackett's photos illustrate that gift. The response to her work has been so very positive that she has begun a company, Brackett Enterprises, Inc.